﻿ Chicago Hispanic Newspaper, Lawndale News, Hispanic Bilingual Newspapers, Su Noticiero Bilingue » Who Or What Killed the Passenger Pigeon? April 22, 2019 9:36 pm You are here:Home Commentary Who Or What Killed the Passenger Pigeon? Who Or What Killed the Passenger Pigeon? Posted by Editor on June 26, 2014 in Commentary | Comments Off on Who Or What Killed the Passenger Pigeon? The passenger pigeon that once roamed all of North America in the millions as we all know is now extinct. The last passenger pigeon died in a Cincinnati zoo in 1914. The extinction of the passenger pigeon has long been blamed on over-hunting of the species in the middle and late 19th Century. But this theory is now being tested. Professor Robert Zink of the University of Minnesota believes that nature itself may have helped contribute to the destruction of the passenger pigeon. In recovering some DNA samples from the remains of the last known species of passenger pigeons, Zink discovered that before the massive over-hunting that helped drive the species to extinction, there had been a natural decline in the numbers of the passenger pigeon. From what records had survived, Zink and other researchers have hypothesized that the numbers of the passenger pigeon were kept in check by the Native Americans who hunted them for food. 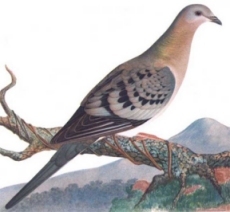 However, since the Native Americans hunted the passenger pigeon on a small scale, the species was never over-hunted and their numbers could recover. But once the Native Americans were pushed out of many of the habitats where the passenger pigeon reigned, the passenger pigeon’s numbers swelled well beyond what they were. Their numbers grew so fast and enormous that they virtually blocked out the sun. They ate so much of the nuts and fruits that there were almost no food sources left for the next generation or the generation after that of passenger pigeons. Because of this, their numbers began to decline. According to Zink, they might have recovered had it not been for the European American settlers coming in and shooting as many passenger pigeons as possible. The result was that this species could not recover, and so became extinct. So in conclusion, the passenger pigeon was already under stress from mother nature when humans stepped in and basically helped tipped the species to extinction. But is this the true story of the end of the passenger pigeon? Since we only have some DNA samples, some historical records, and a new theory to fit the known facts, we may never be sure. Although the extinction of the passenger pigeon occurred in relatively recent times, record information was still pretty primitive, we had no idea what other factors might have led to their decline, and by the time the last one was living in a zoo it was too late to try and figure out why the species went extinct. The only possible good it might do for the future is for us to realize that it may help us how to avoid possible extinction of other species on this planet.